Simon Mundy is a chairman of the UK Association of Creative Professionals and a permanent fellow of Felix Meritis. He is a writer and advocate for the arts. He has written over 20 books – poetry, novels and books on music and cultural politics – and collaborates as a poet with dancers, musicians and visual artists. 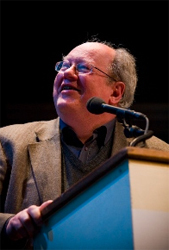 He was a co-founder of Culture Action Europe and directed the UK’s National Campaign for the Arts. He has worked as a cultural policy adviser for UNESCO, the Council of Europe and the Conflict, Security and Development Group at King’s College London.